Greetings! Spring is upon us here in St. Louis and it’s time to start another year of the veggie garden chronicles. 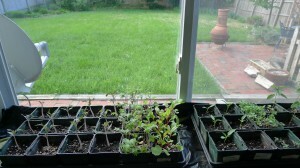 This year I again have grown my plants from seeds. 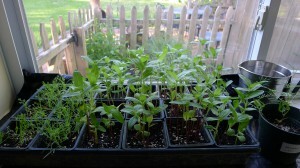 The seedlings in the above photos were germinated on April 4th and are doing well. 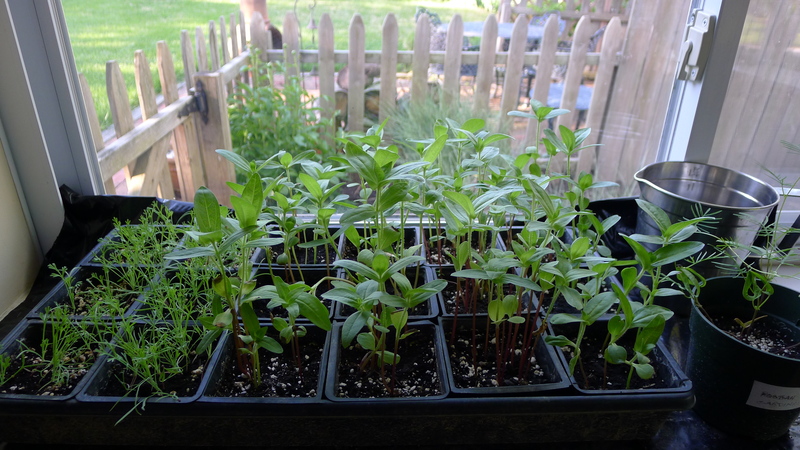 I began hardening them off about a week ago so they will be ready to go into the ground in a couple of days. 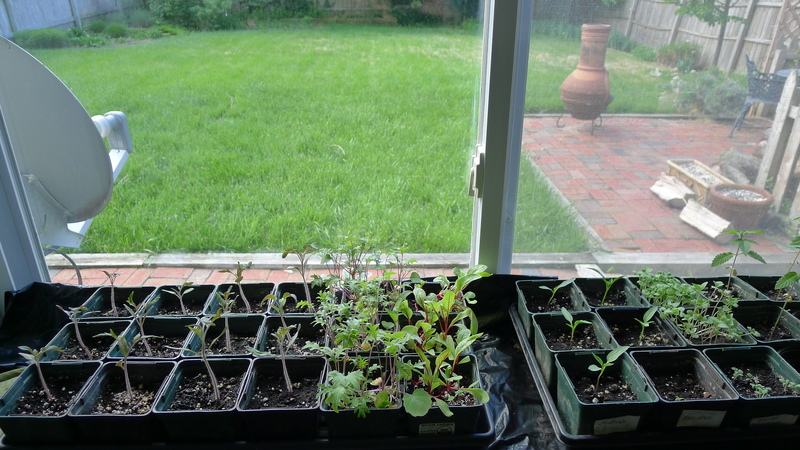 The crop for 2013 will be an interesting one because I sprouted many unusual types of tomatoes and have added kale, rosemary and Asian basil to the lineup, Also new for 2013 are California poppies, a variety of zinnias and some cardinal vines to keep my wisteria company. The top photo is of my tomatoes, hot peppers, kale, Swiss chard, basils and rosemary (specifically: green zebra, brandywine, marvel stripe, black krim, gold medal, speckled roman, and white tomesol tomatoes; ancho, New Mexican, jalapeno and habanero peppers; Italian Genovese and Siam queen basils; red winter kale and red ruby Swiss chard). The bottom photo shows my California poppies, zinnias and cardinal vines (the zinnias include: art deco, envy, California giants, peppermint stick and hot crayon colors). Not pictured are what I directly seeded into the garden: wild arugula, oak leaf arugula, curly endive, mizuna and red mustard lettuces; butternut squash; spider flowers; nodding onion flowers and a wildflower mix called Hummingbird Haven which is supposed to attract those fascinating creatures with flowers that have a high nectar content. If all goes well, this will be a very colorful and fruitful year in the garden!! Fingers crossed! To all of you gardeners out there, may your thumbs be green and your gardens be bountiful! !